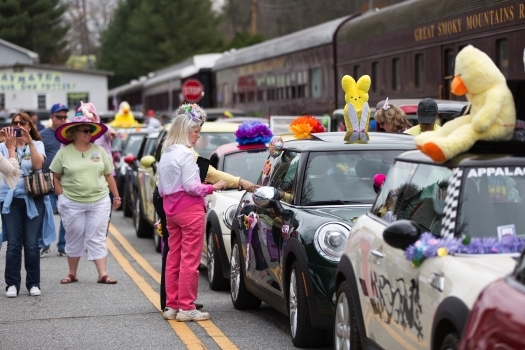 Put a dash of whimsy into your Easter weekend with a spring getaway to the mountain hamlet of Dillsboro, NC, where hundreds will take to the streets for the annual Easter Hat Parade on Saturday, March 31. The spirited parade is open to all, transforming a four-block circuit through the quaint downtown into a cacophony of creative noggins. The wearable art pushes the boundaries of the traditional Easter bonnet. Think hats with moving parts, lights and sounds, smoking dry ice, even live chicks. A gander through the award categories says it all — biggest hat, smallest hat, most outrageous hat, funniest hat, hat with the most spring flowers, and poofiest hat to name a few. Four-legged friends can join the parade as well, with a special trophy for the best dog hat. But in keeping with the parade motto — “delightfully unpretentious” — some trophies are kept in reserve for spontaneous additions to the award line-up. It’s the parade where everyone’s a star and no one gets left behind. Some hats are themed — like the tea party lady who adorns her hat with a teapot and tea cups. Others are sweet and simple — like the man who makes an annual appearance in a baseball cap with a curtain of carrots dangling from his brim. Anders walked in the parade bald one year herself. After losing her hair from chemotherapy, she painted her entire head in a bouquet of flowers. The parade is designed to be hassle free. There’s no numbered line-up, no walking pace, not even a formal registration unless you’re vying for a trophy. Just show up and roll out. The short jaunt around town laps four square blocks, totally doable for the whole family, from toddlers to great grandma. Once hooked, families make the pilgrimage to Dillsboro’s Easter Hat Parade year after year. Now in its 30th year, the parade is seeing its second-generation of marchers — those who walked in the parade as children are now returning with children of their own. “It is something families grow with,” Anders says. Already brainstorming for next year’s hat? Do some reconnaissance by perusing the Easter Hat wall-of-fame and relive the best hats from the past decade. The parade starts at 2 p.m., but come early to enjoy an array of Easter activities throughout town. Stop by the hat making station at Dogwood Crafters between 10 a.m. and 1 p.m. and let your little ones join in an egg hunt at noon and visit with the Easter Bunny, who roves the town between free picture sessions on a white wicker settee. Make time to stroll the line-up of artfully decorated old-time Model A cars that lead the parade each year. “They put bunny ears on their headlights and flowers all around, but careful not to bother the paint job,” Anders quips. A fleet of Mini Coopers have gotten in on the action now as well. Dillsboro’s eclectic vibe serves as the quintessential backdrop for the festivities. Take a stroll along the village streets, which are lined with shops and eateries, and stop into specialty boutiques like the Dillsboro Chocolate Factory and Nancy Tut’s Christmas Shop. The Easter Hat Parade is the perfect anchor for a spring getaway to the NC mountains of Jackson County. Round out your weekend itinerary with an early wildflower hike, a stroll through the outdoor sculpture garden on The Village Green in Cashiers, a movie at Mad Batter Food and Film in downtown Sylva or a scenic trip on the Great Smoky Mountains Railroad. Lodging choices run the gamut from in-town hotels and B&Bs to mountain cabins and country bungalows. Book your stay early, and don’t forget reservations for Easter brunch. It’s officially spring, and Jackson County is ready to Play On.